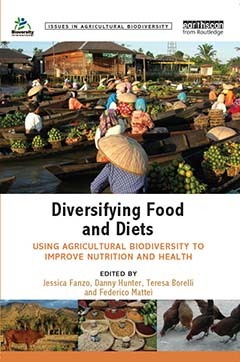 This week, Bioversity International announced the release of a free, open-access version of Diversifying Food and Diets: Using Agricultural Biodiversity to Improve Nutrition and Health, an Earthscan book from Routledge Press, out of their Nutrition and Marketing Diversity Program and edited by Jessica Fanzo, Danny Hunter, Teresa Borelli and Federico Mattei. Through a series of examples and case studies, the book examines the role of agricultural biodiversity in improving diets, nutrition, and food security, with an emphasis on rural and urban populations and societies in transition. Support for this publication came from the UNEP/GEF-funded Biodiversity for Food and Nutrition Project and the CGIAR Research Program on Agriculture for Nutrition and Health (A4NH). The PDF-version of this book is available for download on the Bioversity website at this link.